DO-00653-18 was succesfully added to your cart. Standards have KCl, NaCl and 442 conversions printed on the bottle for ease of use. Temperature corrections are printed on the bottle, with the certified values listed in the tables, and are referenced to 25°C. Two-year shelf-life on all solutions. Certificates of analysis available separately. One 500-mL (17-oz) bottle. Is the temperature chart on the conductivity standard intended to be used to infer the expected conductivity of the standard at various temperatures? If an instrument is correcting for temperature and providing specific conductance, then should the result always be 1413? Is the temperature chart an appropriate way to determine the expected conductivity of the standard at those temperatures if I am using the standard to verify that my instrument is reading conductivity correctly? At 25C, the conductivity is 1413 uS. The lowest temperature data offered is 5C, which has a conductivity range of 896 uS. 1. Go to www.coleparmer.com and enter the item number into the search box and click on the red search button. Be sure to include the dash in the item number. 2. Once on the product page, scroll down until you see "Technical Resources". 3. Under technical resources, you will see another search box titled "Certificate of Analysis". Enter the lot number into this search box and click on the arrow. This should bring up the C of A for your lot number. If the certificate does not pop-up initially, you may need to temporarily disable your pop-up blocker. 4.You may see a note in red, bold lettering stating that the certificate was not found. This is an error and is currently being corrected. You should be able to locate your lot number by scrolling down the list or by pressing "F3" or "Ctrl+F" to search the page for your lot code. 1413uS is calibrated at 25c, do you know the uS at 0c? At 25C, the conductivity is 1413 uS. The lowest temperature data offered is 5C, which has a conductivity range of 896 uS. This temperature vs uS chart is located on the bottle label. The meter manufacturer sells an NaCl conductivity solution. Yours is KCl. Both are 1413 uS/cm. Does KCl vs NaCl matter? Actually, this conductivity solution has conversions to both KCl and NaCl printed on the bottle. It is up to you which you use/need for your application. Is this good standard for electrical conductivity? 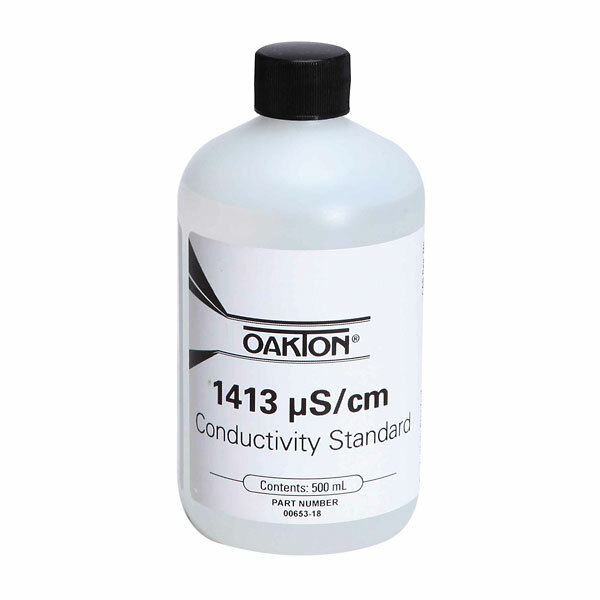 This conductivity standard is very common for calibrating conductivity cells for use in standard solutions. We do carry standards of lower and higher conductivities. For best results, calibrate your conductivity cell to a standard that is close to the expected result of your sample. Certificates of Analysis can be accessed from this webpage. Under technical resources, you will see a search box titled "Certificate of Analysis". Enter the lot number into this search box and click on the arrow. This should bring up a list of C of As. If the certificate does not pop-up, you may need to temporarily disable your pop-up blocker. If the certificate cannot be found initially, scroll down the list until the certificate for your Lot code is found. how does one treat the conductivity probe in terms of solution storage used especially if the probe is new? We recommend that any conductivity probe be stored in specific storage solution instead of regular water. The storage solution is available as catalog number 00652-80. What is the shelf life of an un-opened bottle? What is the shelf life of an opened bottle? The shelf life of the solution is 2 years un-opened, 6 months is opened. how the validity of conductivity calibration standard after opening of the bottle. The solution should be valid as long as stored as suggested for the shelf life of the product. Is the slope (% per degrees C) noted on each solution? This information is not available on the bottle but it is available on the data sheet that comes with the bottle. Good product, I have used it for years. Keep it out of the sun, as it will quickly degrade. It would be nice if the manufacture came out with a larger bottle. Not a whole to say about this item, it does it's job of Calibrating our Conductivity meters. Longer expiration dates would help extend the life of the product, as received. Used to calibrate conductivity meters. Very accurrate and procise. Easy to use. Does the job... no questions asked.